A hands-on event open to the public, making historical red inks and crafting Valentine’s Day cards on vellum. Ashlee Weitlauf and Marilyn Mohr of the Beach Conservation Lab have been systematically experimenting with Vera Keller, History, on researching and preparing historical ink recipes in preparation for this event. The Traveling Scriptorium will be brought to the Craft center for this event. 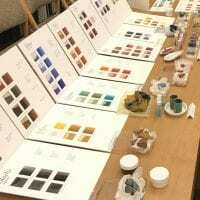 UO’s Traveling Scriptorium is a showcase of more than a hundred pre-modern materials used in manuscripts, books, and paintings—including a wide range of red pigments.